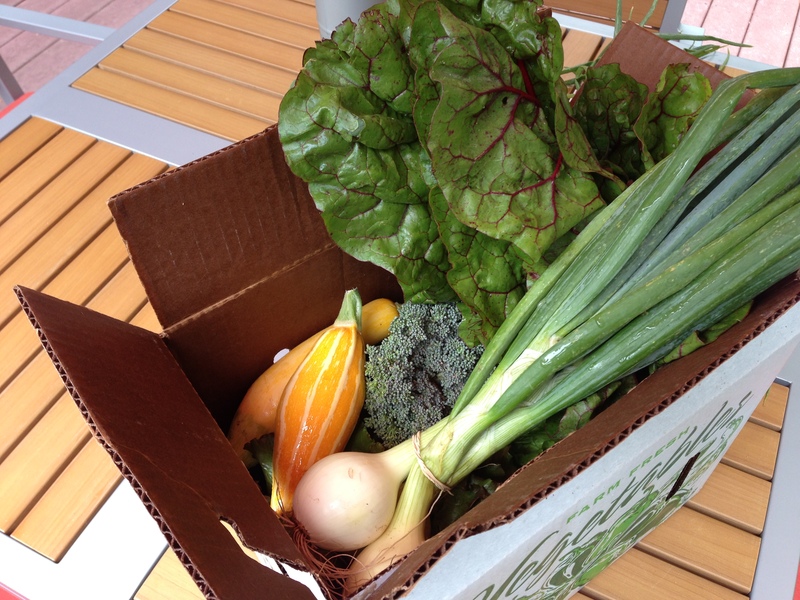 Now when we pick up the share on Sunday mornings it seems like there’s an advantage to showing up closer to 10am, since we fill our own box from the assortment of produce and they were out of green beans by the time we arrived (my children will not mourn the loss of the beans, nor will they cheer the appearance of the broccoli). The chard was the only item I’ve never prepared at home, so I took up that challenge first. A quick poll of friends and a cruise around the internet revealed that everyone just tears the leaves, chops the stems and sautes them with something – pretty much the same as collards. Based on several recipes found, here’s what I came up with to go with the steak and potato salad we served for dinner. 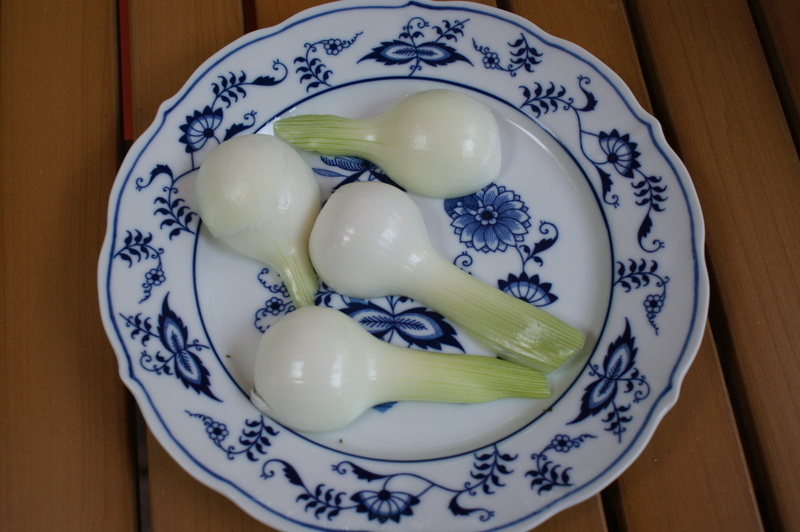 The spring onions were bigger this week so one of them is comparable to a shallot, which is what I would probably ordinarily use (or a small vidalia). In a large skillet, heat the olive oil and cook the pancetta and onion at medium heat until they are browned and caramelized. 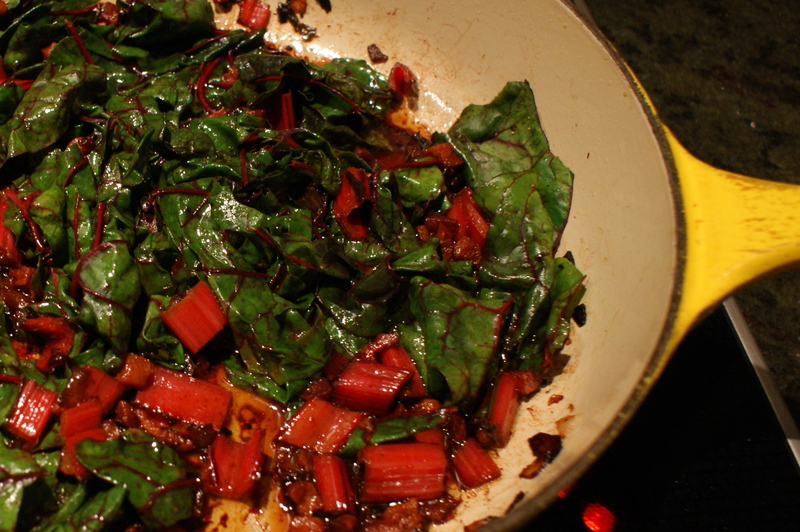 Add the chard stalks and cook for 1-2 minutes, then add the leaves. Simmer for 1-2 minutes then add the lemon juice. Simmer until the leaves are wilted and the stalks are tender. Serve hot. Some folks found the chard still too bitter, but I loved it with the salty pancetta and tangy lemon. It went well with the mayonnaise-based potato salad and would be very nice in winter alongside risotto. Another use of the spring onions was simply to cut the tops off, trim them, halve them, brush them with olive oil and cook them, cut side down, on the top rack of the grill – 6-8 minutes, depending on your grill and how crunchy (or not) you like them. 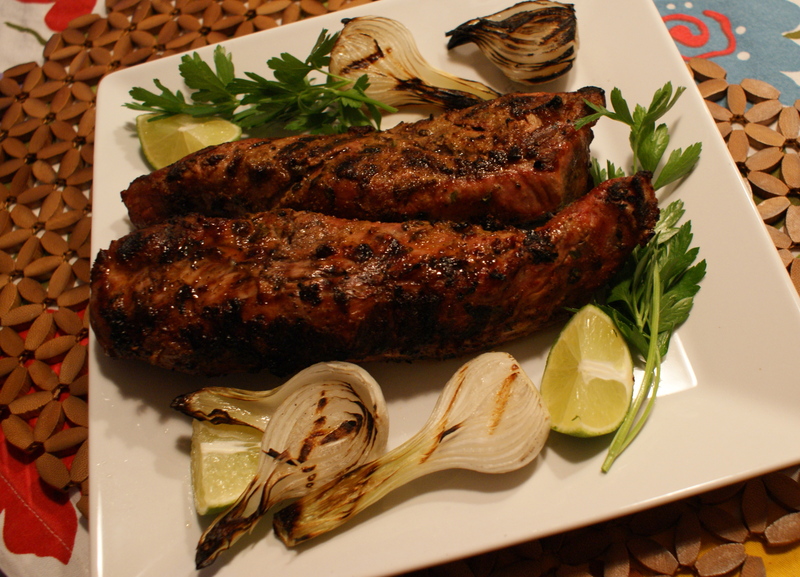 I served them with a grilled pork loin that had been rubbed with cumin, ground black pepper, sea salt, olive oil, garlic and lime juice. This entry was posted in Bacon, Community Supported Agriculture (CSA), CSA, CSA Adventures, Dinner, Farm Share, Gluten free, Leafy greens, Lemon, Mayonnaise, Spring Onions, Vegetables and tagged collards, CSA, dry white wine, farm share, grilled spring onions, lemon, pancetta, pork loin with cumin, spring onions, summer menu, swiss chard, swiss chard with pancetta and spring onion, vidalia. Bookmark the permalink.